Heroic summon but no Jibber? I just tried to summon Jibber with a 10x heroic summon and I got no tokens. I then saw the hero drops and he’s not even listed there! But on the event screen he’s supposed to be available through that portal. What’s going on? Can I get those 10 summons back please? Same happened to people in our guild. I’m waiting to do pulls until we find out what is going on. 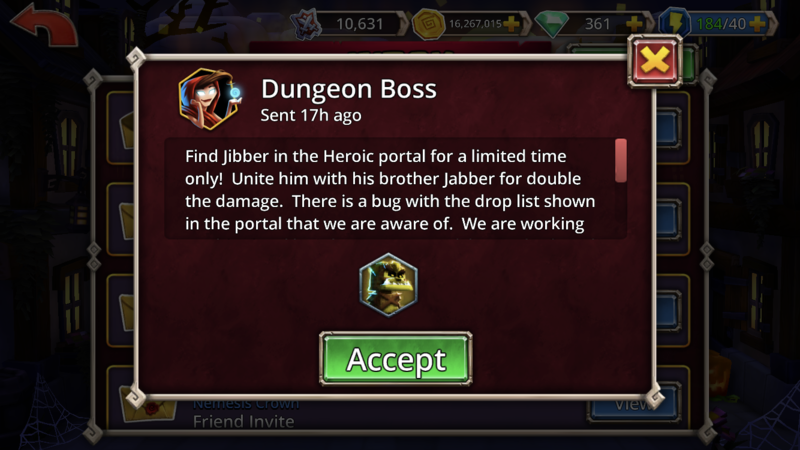 Jibber isn't guaranteed with a 10x summon, and we have confirmed that he is indeed in the portal. We are currently working on a fix for the drop list issue. Can confirm: I just got the full unlock and a token chest while he wasn’t on the drop list. Then again, the drop list isn't able to update to show Heroes that are featured temporarily. I got a full 8 tokens from a 10x summons. DB is getting lazier and lazier with these events. All they want is money. The message in my inbox was a bit misleading. It seemed to say that though he doesn't appear in the list, he really is featured in the portal. Featured usually means guaranteed unlock or 25 tokens. First 10x pull he was "unlocked" but tecause I received 10 tokens but hadn't claimed him, that meant the 10x gave me nothing. Second 10x pull got me 4 tokens. It took 2 10x summons to get enough tokens to actually summon him. It doesn't say he's featured though, just available. 10x heroic summon and I got no tokens. Give me back this 10 summons ! 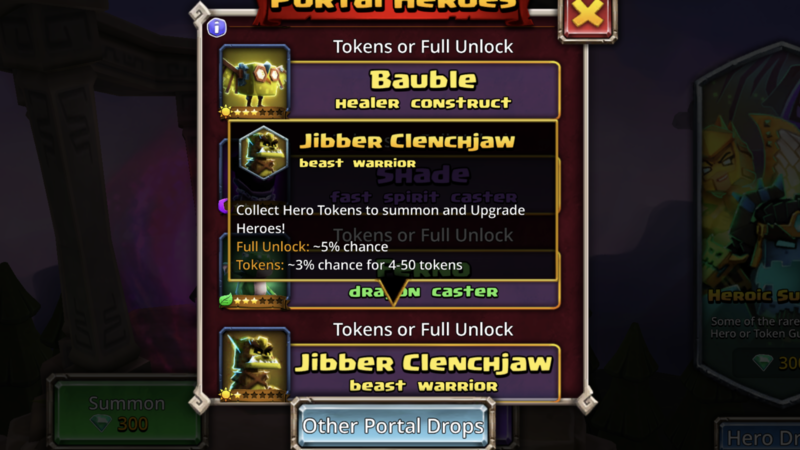 After two x10 heroic summons I only got 4 Jibber tokens. Disappointing to say the least, considering the new hero's face is plastered all over the event screen and this is the only way to get him. @SpockIsMyDad We didn't say that Jibber is featured in the portal, we said he is 'in' the portal. We are in the process of releasing a patch that will make sure Jibber is listed in the portal drop list. Thanks for your patience! You are certainly correct Joel, you didn't say this. However, in the past it was routine that the special hero for an event was featured. Combine this with the fact that this is the first time you released a new hero in the heroic portal instead of charging an arm and a leg in door events in over a year, and the drop chance and fact that he was even in the portal weren't listed.... well the whole thing just leaves a bad taste in our mouths. Is that a minus 5%. Will they take my tokens away? That means it's around a 5% drop chance. There's a 4.9% margin of error.